Wild swimming or outdoor swimming in rivers, lakes, lidos and sea is a sport that is regaining popularity in the UK. This page highlights news items that illustrate the popularity and growth of wild swimming as well as comparing attitudes in the UK with those aboard. 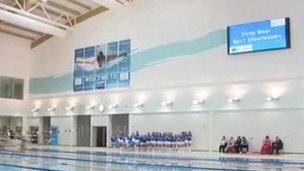 Malcolm Tozer Reviews: Hung Out to Dry: Swimming and British Culture, in the Spring Edition of Physical Education Matters. It was by chance that your reviewer came across this privately published social history of swimming and the evident enthusiasm of its author – devotee of outdoor bathing and self-taught historian – prompted the request for a copy. Chris Ayriss’s idiosyncratic approach is as refreshing as the waters he loves and the ebb and flow of his story matches that of meandering stream; you never know what is round the next bend. The book spans ancient and modern, from the Roman occupation of Britain right up to the health-and-safety madness of present times. On the journey we meet bathing to satisfy superstitious, ritualistic, religious, medical, sensual, sexual, naturist, hygienic and escapist needs – amongst others – sometimes with the active approval of society, sometimes not. It would seem that skinny-dipping just for fun was never as simple as that. Bathing’s real boom began in the mid-Victorian period when Thomas Cook introduced cheap rail excursions to seaside resorts; week-long factory closures saw whole towns decamp to Skeggie or Clacton; Billy Butlin’s promise of a week’s holiday for a week’s wage led to the popularity of holiday camps; major resorts competed for the biggest lidos and the highest diving boards; and inland cities provided their own riverside beaches and swimming lakes. Some marvellous photographs show packed crowds on Blackpool beach in 1949, with no room to swing a spade; sand-castle building in the shadow of London’s Tower Bridge in 1939; a sardine-jammed lido in Bristol in 1937; and fantastic multiple diving platforms at Henleaze and Weston-super-Mare. The demise from the 1960s was sudden: it came with the introduction of cheap flights to Mediterranean beaches; the delights of sun and sangria; the building of corporation indoor swimming complexes; riverside landowners denying right of access; health concerns about polluted rivers, canals and lakes; and safety worries over unsupervised bathing. Recent evidence from my outlook in Cornwall suggests that a partial recovery is underway – helped by the economic recession, the popularity of ‘staycations’, and the ready availability of wetsuits. Is the bucket-and-spade holiday back in fashion? All this is told in a jaunty style. A bevy of blurred boys’ bare bottoms may see the book banned from school libraries, but there is much here to inform and entertain all who have ever delighted in a midnight skinny-dip – outdoors, of course. The Legacy of Free Swimming. The chart above shows the steep rise in swimming popularity as a result of the government’s free swimming program as reflected in swimming pool attendances in Bradford. Similar statistics countrywide show a degree of success in getting firstly those over 60 and later those under 16 active and into the water. Despite the steep increase in attendance figures peaking in 2009-10, the economic slump led to austerity measures and funding cuts. The goal of free swimming for all by the time of the Olympics in 2012 disappeared down the plughole as funding cuts saw an end to free swimming sessions and led to pool closures, timetable adjustments, reduced opening hours and efficiency savings. The statistics show swimming attendance figures have dropped well below those achieved prior to the government’s intervention, so why the steep drop in attendance figures? Further budget cuts paint a bleak picture for the future of British swimming. Although children are being encouraged to learn how to swim, swimming is becoming an extravagance many families cannot afford. Despite the concessions available it is difficult for parents to justify the expense of family swimming, and especially so when the activity was formally free. Wild swimming is available for free throughout the country and continues to grow in popularity. Gladys McInley, from Park Road, Teddington, was 107 on Wednesday, November 28. The Richmond Twickenham Times reports her brother Walter Fox, 96 years young as saying: “I think her secret of long life is her outdoor lifestyle. “She used to do swimming and outdoor camping and all that. She swam until she was about 80. “I also swam every day until I was 86. That’s the only thing I can think is the secret to such a good age. Outdoor swimming and fresh air are a real tonic, lifting the spirit and strengthening the body. Staffordshire County Council fears some may be inspired by the Olympics. Open water swimming has been singled out as too dangerous a sport and so people are being warned not to be inspired by the Olympics and swim in open water during the summer. This is not the opinion of a growing number of wild swimmers. The experience of swimming in rivers and lakes can in fact do much to build confidence, encourage participation in sport and may well fulfill in part the aim of the Olympics to ‘Inspire a generation’. Of course there are risks; just as those inspired to run will need to cross busy roads, those inspired to cycle will need to display a little road sense, and just the same, those inspired to swim will need to display common sense. Do we want to keep athletes in doors? Runners on tread mills, cyclists at spin classes and swimmers in swimming pools? The fact that swimming has been singled out says a lot about British cultural attitudes towards open water swimming and reveals an underlining prejudice towards swimming in the wild or as it is now known: Wild Swimming. Rutland Water Bathing Beach may open after all! Wild swimmers were disappointed to hear at the weekend that after deciding to put years of prejudice towards open water swimming aside, the opening of a bathing beach at Rutland Water was to be postponed. Let us hope that we will be able to celebrate the freedom to swim in Rutland Water in this special Jubilee Olympic year. If you are puzzled by the attitude to open water or wild swimming here in England, you may enjoy reading the history of open water swimming: Hung Out to Dry available from just £9.99 including P&P. For the latest news on Rutland Water Bathing Beach click here. Where to swim with turtles in Tenerife for Free! Wild Swimming at Beckenham Place Park! River Swimming - Good or Bad?